Starmobile, the trusted Filipino smartphone brand, in partnership with Smart Communications, the unrivaled mobile service provider, launched today the Starmobile Play Click 1288 Bundle, a value-packed Android phone powered by Smart. 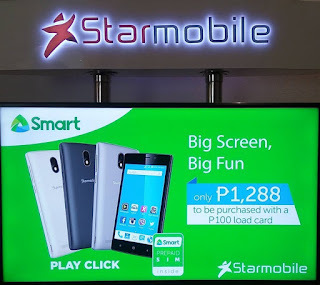 The Starmobile Play Click sports a 4.5-inch display, or about 0.5-inch bigger than the previous bundle from Smart and the other bundle from the competing telco. On the inside, it is powered by a 1.3GHz quad core Spreadtrum processor coupled with 512MP of RAM and 4GB of expandable storage. The handset is a dual-SIM device, the SIM 1 slot is locked to the particular Smart SIM card bundled in that specific package, while the SIM 2 slot is opened for Smart, Sun Cellular, and Talk N' Text. In terms of freebies, consumers get 100MB of free data per month for one year plus, no purchase required and it will be credited once the SIM is activated. Moreover, users also get 30 pesos load rewards per month for 12 months, provided they accumulated at least Php100 load on the previous month. The Smart Starmobile Play Click 1288 Bundle will be available nationwide in Smart and Starmobile concept stores as well as through Smart Online Store at smart.com.ph/store this coming June 17 until the end of August. To avail the bundle, you need to shell out a total of Php1,388 - 1288 for the phone and 100 for the prepaid load.